The Flatiron Spinning Wheel rises from a flat-packed box much like Boulder’s iconic Flatirons tilted up from a once-horizontal position. The elegant design of the formed maple ply body calls upon the same drama that makes the Flatirons so striking. This unique Saxony style wheel is anything but traditional, much like the company’s hometown of Boulder, Colorado. The superb Flatiron Spinning Wheel is customizable; you can build it with either the flyer on the left or the right. With self-aligning bearings in the maidens, and a fully adjustable drive wheel, the whole system is sure to spin true. The clever quick-release lever makes changing out bobbins trouble-free. 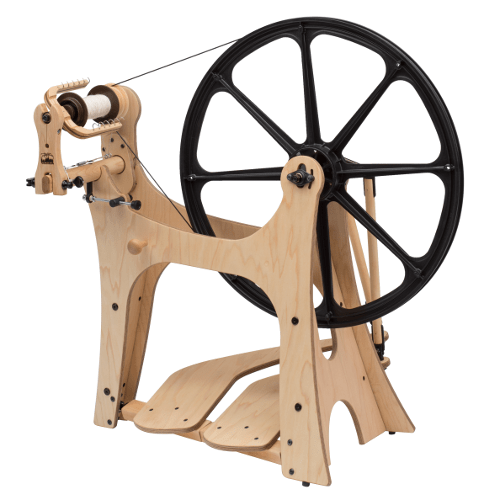 The Flatiron Spinning Wheel can be set up in all three tension systems (Scotch tension, double drive, and bobbin lead). The Flatiron comes with medium and fast whorls; the extra slow, slow, high, and super high speed whorls can also be used for a wide range of rations. Included acccessories: poly drive band, threading hook, 3 travel bobbins, medium and fast whorls, and a double drive band.